Measure your heart rate instantly! 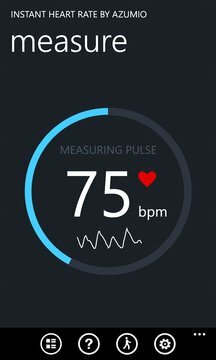 Instant Heart Rate uses your phone's camera to detect the pulse from your fingertip. 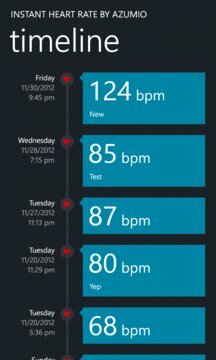 It leverages similar technology used in pulse oximeters. NOTE: Make sure that your fingertip completely covers the camera lens. Press gently; pressing too hard reduces blood flow in your finger and makes it harder to get a pulse reading. Make sure that your fingers are not cold. This application is for recreational and fitness use only!